Editor’s Note: This piece originally appeared on UConn Today, the University’s official news website. As of 2013, only 20 percent of school administrators were people of color and only 50 percent were women, despite women representing almost 80 percent of teachers. The number of black female principals is even harder to assess, though research suggests they represent a smaller proportion of black principals than do their male counterparts. Beyond this underrepresentation in the field, black female principals face an additional set of challenges in these positions in the form of microaggressions. Through a $50,000 grant from the Spencer Foundation, Neag School assistant professor of educational leadership Jennie Weiner will investigate how microaggressions and discrimination affect the experiences of 25 black female principals. Neag School professor Laura Burton is the co-investigator on this project. Microaggressions are subtle acts of discrimination that occur on a daily basis. They can exist at the environmental level, for example, via exclusionary policies that create segregated communities and schools. They can also operate at the interpersonal level perpetrated by co-workers or strangers on the street. Microaggressions can be enacted when someone makes a comment about a person’s race, gender or other aspect of their identity that may not be obviously or even intentionally racist or sexist. Despite the intent behind it, microaggressions carry the same prejudiced connotations and negative impact as more direct forms of prejudice. Black female principals also tend to be relegated to the most segregated and poorly resourced schools in the country. These discriminatory practices create unique challenges for these women and their ability to thrive in their jobs as school leaders. According to the National Center for Education Statistics, just 10 percent of principals are black and 80 percent of public-school teachers are white. These demographics highlight the isolation black women principals often experience, as well as the structural nature of their exclusion. 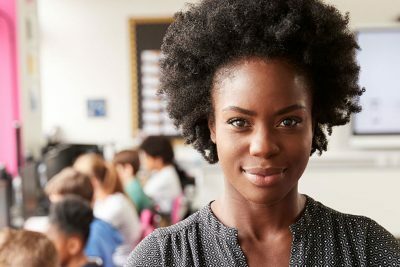 Previous research on black women and other minoritized groups suggests this environment would be a likely locus for microaggressions, and yet information about how black women experience the role of school principal has not been studied specifically. This research provides opportunities to identify the unique challenges these women face as well as their triumphs and the source of their strength in the face of adversity, according to the researchers. The results of this study can also be used to make recommendations for institutions to implement changes that improve the experiences of and opportunities for black women to succeed in leadership positions. Research shows black women often have fewer opportunities to join traditional professional networks and access the resources available through them. Through this grant, the researchers hope to provide resources for participants to create professional networks to facilitate opportunities to join a supportive community and to support one another through the challenges associated with their particular situations. The Spencer Foundation funds research which investigates how education can be improved around the world. Since the foundation began awarding grants formally in 1971, it has provided $500 million in funding. Jennie Weiner holds a, ED.D. in educational policy leadership and instructional practice from the Harvard School of Education. Her areas of expertise include educational leadership, school reform and education reform. She focuses on chronically underperforming schools and districts as well as gender and racial bias in educational leadership and issues of educational structure at the state, district, and local levels. Laura Burton received her Ph.D. in the social science of sport and sport management from the University of Connecticut. Her research interests include understanding leadership in organizations and exploring development, access, and success in leadership. She focuses on issues of gender in leadership contexts and how stereotypes and discrimination affect women in sport leadership.